Dayco is recognized by the automotive industry as a world leader in the manufacture of timing belts. Dayco timing belts are manufactured using materials and workmanship that meet or exceed OE requirements. 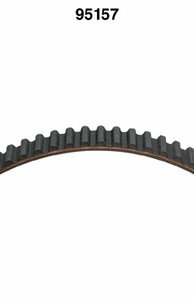 This specific belt is for applications with standard temperature and load with a round tooth, flat tip profile.